This is Deja Vu all over again: a Game 7 to determine who goes to the Stanley Cup Final. Last year (and earlier this playoff season), Bryan Rust played Game 7 LEGEND. Can he do it one more time? Join me and some other members of the Pens Initiative crew as we drink scream freak out watch how the game unfolds. Say something snappy via the comments below or Twitter and I'll make you part of the conversation! Hit "Refresh" early & often! 8:04 PM: I'm nervous. You're nervous. Imagine what it must feel like to be a player– or even worse– the family member of a player. AHHHHHHHHHHH!!!!!!!!! 8:07 PM: Penguins are 1-for-1: they resisted the temptation to get a Nashville-esque name to sing the anthems and stuck with Jeff Jimmerson. 8:10 PM: Opening faceoff about to happen. How's 'bout Crosby NOT take a penalty on said draw, k? 8:11 PM (19:59, 1st): Update: Crosby didn't take a penalty. 2-for-2. 8:12 PM (18:30, 1st): Discarded stick still chilling in Penguins' end. Not sure when or why referees take sticks off the ice. 8:13 PM (18:14, 1st): Fans angry about a non-call on both sides of the ice. 8:14 PM (17:50, 1st): Starting Sheary after his weak (literal) showing is a pretty big risk by Head Coach Mike Sullivan. 8:15 PM (16:30, 1st): The Senators botch a 3-on-2 opportunity as a random slapshot from beyond the circle is blocked and cleared. Not even an effort to take advantage of numbers. 8:17 PM (14:35, 1st): Phaneuf gave the puck away, and Crosby had two scoring opportunities. Seconds later, Ottawa countered and following a scrum in front, Murray made one save. Then the Penguins botched a 3-on-2 after a pass to Malkin went into #71's skates and he couldn't retrieve it cleanly. 8:19 PM (12:45, 1st): MacArthur given a primo scoring example following a Red Sea defensive separation. Murray turned aside the off-speed shot. Penguins with offensive zone pressure. RUST ON THE ICE! 8:22 PM (10:04, 1st): After 7 minutes of uninterrupted play, the clock stops and the commercials come out, right before the mandatory 10 minute commercial break. ***BREAKING*** This guy seen at the game lugging goalie pads. 8:26 PM (9:30ish, 1st): ...and we're back to commercial break. Very exciting. 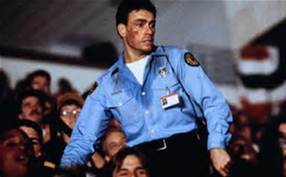 Gave me a time to pull up a JCVD image from "Sudden Death" because, you know, it's totally relevant tonight, especially with the recent passing of Powers Boothe. 8:28 PM (8:21, 1st): Nothing is as satisfying as the puck skipping over the opposing team's stick at the point. 8:32 PM (5:02, 1st): Wow. 8:37 PM (2:49, 1st): I've censored myself a half-dozen times. Scott Wilson was called for 'slashing' and then a penalty was missed on Ottawa. Pierre admonishes the refs. 8:40 PM (57.4, 1st): Ottawa centering pass from Murray's right goes incomplete, Penguins avoid a catastrophic late goal. 8:43 PM (End of 1st Period): Ian Cole actually attempts a shot (the Penguins are shying away from shooting through the collapsed defense), makes a fantastic keep to set Crosby up on an abbreviated 3-on-2. Anderson has a– gulp– Carey Price calm about him right now. 8:58 PM: So, the guy in the GEICO/stranded car commercial: what else has he been in? And what's the point of the kid playing the...guitar/ukulele/thing/niner? 9:01 PM (19:45, 2nd): Gotta figure that the Penguins are owed a power-play, maybe 42. 9:03 PM (18:30, 2nd): Rust took an ill-advised Malkin pass and nearly slid it past Anderson. Alas, nothing. 9:04 PM (17:20, 2nd): Sheary showing some jump. Good for him. 9:09 PM (14:55, 2nd): Kunitz nearly scored. This commentary is hard to keep up because I'm alternating between rolling around on the ground in agony, praying, and yelling at inanimate objects. 9:11 PM (13:20, 2nd): Geno flies around the ice, but doesn't manage to get the puck on net either via shot or setting up a teammate. 9:16 PM (10:50, 2nd): Carl Hagelin with a beautiful, point-blank opportunity: right into the breadbasket of Anderson. ...only to see Mark Stone answer only 20 seconds later. I hate hockey. 9:28 PM (6:58, 2nd): Crosby misses a wide open net, Sheary tips it barely wide. Sheary/Kunitz/Crosby creating chaos but unable to score. 9:34 PM (3:34, 2nd): Maata takes the man in the neutral zone, leads to an Ottawa 2-on-1, which was foiled by Trevor Daley, but Maata took a high-sticking penalty. Woof. 9:37 PM (1:36, 2nd): Pens have killed off the penalty, but puck still in the offensive zone. 9:46 (PM (2nd intermission): Pittsburgh has had the better of opportunities, but stress stress stress. 10:00 PM (18:08, 3rd): I apologize for the lack of updates and humor. STRESS. 10:02 PM (16:30, 3rd): Murray just BARELY tips a puck over the crossbar. More stress. I gave up, and posted something else. TOO. MUCH. STRESS.